Woman Constable Camille Spence, assigned to Tourism and Commerce, assisting a visually impaired man in crossing the busy Market Street in Montego Bay on Tuesday. Caption: Policewoman thinking to herself: Little does this blind fool know i am taking him straight to jail for attempting to drive that black SUV (in the background). Caption: 'The Kind' leading the blind. Caption:I may be Blind, but mi know police when mi si dem! Caption: a wanda if she know mi have weed ina mi pocket sah..
Caption: constable.."hey watch where you putting your stick"
Caption: After a 2hr stand off, area don ray-choppa-charles surrenders to the extradition services officer. Caption: Officers are kind-hearted too... 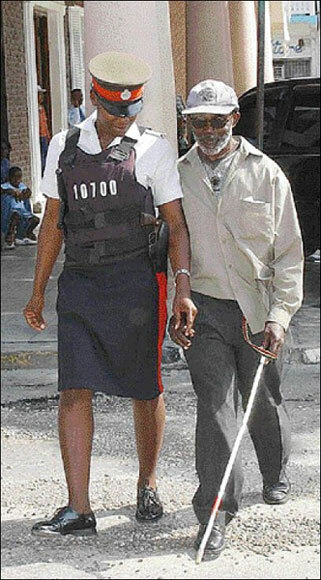 Here Female Constable Camille Spence is assisting a blind man. Thank you for the 128 responses we received. Enter again and we hope you will be the outright winner next time.